Helpersmasters@airmail.cc Ransomware might not seem like much, but it is a dangerous computer infection that will encrypt most of your personal files. Ransomware programs hold personal files hostage as they try to push their victims into paying the fee for the decryption key. Needless to say, you should never consider paying these crooks. Simply follow the instructions below this description to remove Helpersmasters@airmail.cc Ransomware from your system, and when you are done with the removal, be sure to restore your files, too. It might take some effort to do that, depending on whether you have a system back or not. There is nothing spectacular or unfamiliar about the way Helpersmasters@airmail.cc Ransomware spreads around. Just like most of the ransomware programs, this application employs spam email campaigns or unsecured Remote Desktop Protocol for distribution. It just means that you should never open files that you receive from unknown senders. In fact, sometimes it might seem that your friends send you something, too. But if their accounts have been compromised, those accounts could be exploited for ransomware distribution. Thus, if you receive something unexpectedly, you should think twice before you open that file. If you think that you must open the file no matter what, you can also scan it with a security tool, so you could avoid the landmine. As far as the origins of Helpersmasters@airmail.cc Ransomware are concerned, this program belongs to the Scarab Ransomware family. We have discussed programs from this group many times before. For example, there’s also Scarab-Good Ransomware, Scarab-Cybergod Ransomware, Scarab-Glutton Ransomware, and so on. Since there are many programs in one family, there is a good chance that security specialists have come up with the decryption tools for these programs. Not to mention that Helpersmasters@airmail.cc Ransomware was discovered more than 6 months ago, so you should definitely look for a public decryption tool when you remove this infection from your computer. That aside, Helpersmasters@airmail.cc Ransomware behaves like most of the programs from the same group when it enters a target system. Upon the installation, it scans the system looking for all the file types it can encrypt. When the scan is complete, the program launches the encryption, and all the affected files receive the .helpermasters@airmail.cc extension at the end of the filename. This way, you can definitely see which files were affected by this program. Not to mention that the system will no longer be able to read those files, and so the file icon will be different. YOUR FILES ARE ENCRYPTED NOW! You have to pay for decryption in Bitcoins. The price depends on how fast you write us. As you can see, there is no set ransom fee in the first place. The criminals behind this infection can call whichever amount they want, depending on how “fast you write” them. This means that they can severely rip you off and don’t even issue the decryption key in the first place. That wouldn’t be too much of a surprise because it is very common for ransomware command and control centers to go offline, and the same could happen to whoever is controlling Helpersmasters@airmail.cc Ransomware, too. To take everything into account, you need to remove Helpersmasters@airmail.cc Ransomware right now. Do not even think of contacting its developers and paying the ransom. If you have copies of your files saved someplace else, you can delete the encrypted data and then transfer the copies back into your hard drive. If you do not have a system backup, you can look for a public decryption key, or retrieve some of the most recent files either from your mobile device or from your inbox. You might also have some of your files saved on a cloud drive. Explore all of your options and, if necessary, address a professional technician. Delete a 6-character random-name entry under Software. On the right side, right-click and delete a 6-character random-name value. Exit Registry Editor and press Win+R. Type %USERPROFILE% into the Open box and click OK.
Delete the ransom note and the random-name BMP format file from the directory. 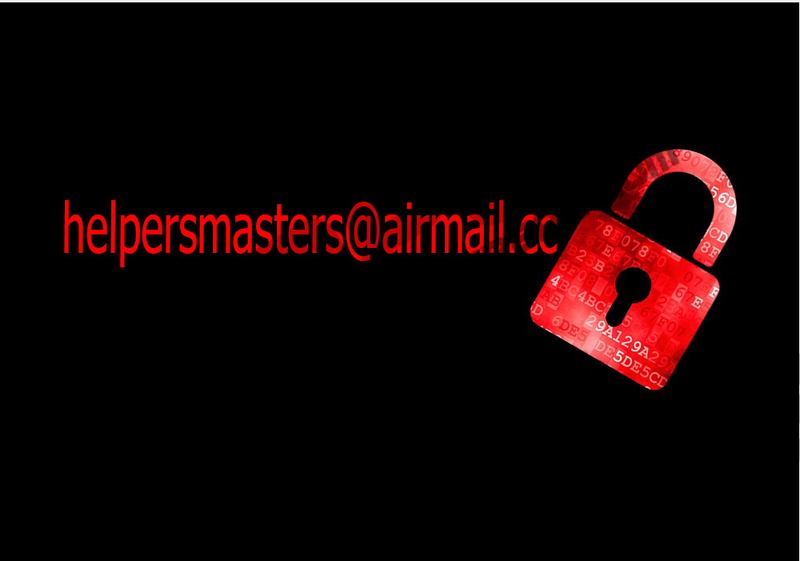 Quick & tested solution for Helpersmasters@airmail.cc Ransomware removal.